Buroak Wilderness Living Skills is dedicated to providing programs that build self-confidence, encourage self-reliance, and increase proficiency in living in the outdoors. Our wide range of courses and accommodations are designed to appeal to people from all walks of life, with varying skill and comfort levels. We want you to enjoy your experience, not suffer through it! 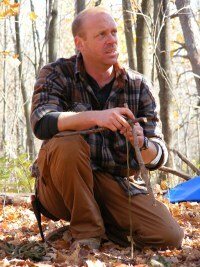 Lucas Wagner has over 15 years of experience teaching wilderness living skills. He spent 4 years heavily involved in Scouts Canada, including the Bushcraft Leader Program. He considers himself fortunate to have had the opportunity to learn from Canada’s own Titan of Bushcraft, Mors Kochanski, and continues to apply the skills acquired any chance he gets. When Lucas isn’t out in the wilderness, you can often find him studying the journals and books of traditional woodsmen like Kephart, Nessmuk, and Miller.